There are several additional material assessment tools. An environmental product declaration (EPD) is a detailed report, developed by a manufacturer, that lists product ingredients and environmental impacts that occur over the entire life cycle of a product, and outlines the impacts a product has in a range of environmental categories such as scarce resource depletion, energy use, waste generation, and missions. EPDs provide information that is usually considered confidential by companies, and provide it in a consistent way. EPDs are difficult to achieve because they’re very data intensive and manufacturers have not always been enthusiastic about participating in programs that require full product disclosures. As pressure mounts to incorporate green materials and products into buildings, however, this reluctance is changing. One of the values of environmental product declarations is that life-cycle assessments are used to develop their data. A life-cycle assessment (LCA) is a technique for evaluating a product’s environmental impact from a raw material which is harvested in some way, through a supply chain involving transportation and delivery, through processing and manufacturing, which turns the raw material into a product that is then installed and used. Some time later—days or years or decades—the product reaches the end of its life and is recycled, degrades back into a raw material, or is disposed. This process from beginning to end is called the product’s life cycle and information on the environmental impact of a product throughout the entire process are included in an environmental product declaration. Life-cycle costing (LCC): With conventional buildings, decisions regarding products and systems are typically made based on up-front purchase and installation cost estimates. Life-cycle assessments (LCA) are used to evaluate the environmental impacts of a product over its lifetime; life-cycle costing (LCC) analyzes costs over the entire life of a product. In addition to initial purchase and installation expense, LCC analyses look at operating costs such as fuel, anticipated repair and replacement costs, residual value or costs (such as sale or disposal), finance costs, and more. LCC has been used for many years and has formed the basis for product decisions for many project types. Green products or systems that that are chosen for durability and efficiency may cost more initially, but an LCC can often show economic advantage over time. The interest in and use of EPDs is growing: as of 2011 France has required that all high-volume consumer products include an EPD label. Other countries, including the United States, are likely to follow. While the primary function of an EPD is to disclose information on the environmental impacts of materials and products, two additional labels are health and ingredient disclosure tools: the Health Product Declaration (HPD), initiated by the Healthy Building Network and the publisher BuildingGreen, and the Declare product database and label from the International Living Future Institute. The HPD is a standard format for reporting product content and associated health information for building products and materials. The system is overseen by the HPD Collaborative and the goal is to provide transparent disclosure about product content and for this information be freely available for all to use. The similar Declare product database from the International Living Future Institute (sponsor of the Living Building Challenge building assessment system) is a program that provides a framework for manufacturers to voluntarily publish ingredients, sources, and manufacturing locations for their products. (Although the International Living Future Institute does not independently verify manufacturer’s claims, it requires that a company leader personally attest to the accuracy of the information and it assesses whether a product contains any ingredients listed on the Living Building Challenge red list. The red list of 13 of the worst-in-class toxic chemicals and materials commonly found in building materials today identifies chemicals not allowed in projects seeking certification under the Living Building Challenge.) The Declare label can be used with any product. Living Building Challenge project teams can also use the Declare label for materials documentation, streamlining the process of project certification. The market is in the midst of innovation, testing, and improvement, and it is worth noting that many green products and systems are new and untested, and sometimes don’t survive in the real world as well as they did in the lab. This “friction in the system” shouldn’t cause you to throw up your hands and walk away, however, but is an argument for doing the necessary homework. HPDs, Declare labels, and EPDs are all disclosure forms that assist in determining if a product meets project performance requirements and are helpful tools in this process. We like sharing interesting and helpful resources. There are many excellent organizations, electronic links, blogs, books, buildings and new products that we think are especially noteworthy. Some things are interesting in part because they’re new and innovative, such as a state-of-the-art sustainable building, others have been around a while but are worth revisiting. If you have a resource that you particularly like and would like others to know about, pass it along to us at notes@KirshnerBooks.com. Here are just a few of our favorites; there will be more posted on an on-going basis so check back. As we go about our lives – sitting, walking, exercising, sleeping — each of us gives off energy in the form of heat; some are asking, Why waste it? In Paris, architects designed a system that captures the heat generated from subway commuters and uses it to radiantly heat 17 nearby apartments. A similar project in Stockholm’s Central Rail Station harnesses the heat from 250,000 daily commuters. The station’s ventilation system captures the body heat, which it uses to heat water in underground tanks. From there, the hot water is pumped to the heating pipes of a nearby office building, saving it 25% on its annual energy costs. 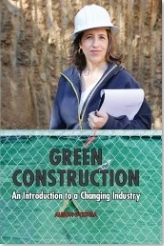 For more information on the book, the table of contents, and a brief excerpt see Green Construction: An Introduction to a Changing Industry. Here’s a very cool idea: an airborne wind turbine. In 2013 Google purchased Makani Power, the company that developed the Makani Wind Turbine. The growth rate of green construction is accelerating. This acceleration is not specific to one building or project type but crosses all sectors. According to McGraw Hill Construction’s 2013 Green Outlook, the value of green building grew from $10 billion in 2005 to $78 billion in 2011 and, in 2013 is expected to climb to somewhere between $98 billion and $106 billion. By 2016, this number is anticipated to reach $204 billion to $248 billion. U.S. Green Building Council – www.usgbc.org– has chapters nationwide. It developed the LEED green rating system for buildings and professional credentialing, and sponsors the annual GreenBuild Conference and Expo. The2013 conference will be held in Philadelphia (www.greenbuildexpo.org). Solar Energy Industry Association – www.seia.org – has a variety of helpful information on solar energy. Interstate Renewable Energy Council – www.irecusa.org – has links to helpful data bases, training providers, and available incentives for renewable energy sources. National Association of Home Builders (www.nahb.org) and its workforce development arm, Home Builders Institute – www.hbi.org ; a trade association that promotes housing policies and offers a variety of training opportunities. Builders Exchanges are in communities across the nation and in addition to “plan rooms” where contractors can access information about projects, many offer classes, newsletters, and other sources of information on skills training. Some unions are becoming actively involved in green training and promoting green jobs (the IBEW, UBC, and USW are particularly active). See your local union rep for information on what they offer. Check out your local community college: many offer classes in various aspects of green construction. Some provide distance learning opportunities. The U.S. Dept of Energy Energy Efficiency & Renewable Energy site – www.eere.gov – has lots of useful information and links. DOE’s National Renewable Energy Laboratory (www.nrel.gov) focuses on energy research and analysis and has an extensive website that’s loaded with interesting information. www.constructionweblinks.com has an extensive list of links to technical resources. Do we really need so much fossil fuel? Builders Exchanges – Located throughout North America, Builders Exchanges are local associations of contractors, suppliers and others involved in the construction industry who pay dues to be part of a chapter. Builders Exchanges provide a range of services, including plan rooms, group insurance, contract documents, advocacy and education. The plan rooms are of particular interest as those interested in submitting bids on upcoming projects can inspect plans and specifications. To find an Exchange in your area go to www.bxnetwork.org. The Construction Specifications Institute is a national organization that was founded with the purpose of improving the quality of construction specifications. Their mission is to advance building information management and their primary effort has been the development of MasterFormat and related systems for organizing project data. One of CSI’s most valuable assets is that they are made up of all sectors of the industry – contractors, designers, specification writers, suppliers, manufacturers, and product representatives. CSI is a great place to network, find out what’s going on, and swap information. To find out more about them and to locate a local chapter see www.csinet.org. This is a free online daily newsletter that summarizes information on large commercial projects around the country. Find out what’s happening – a multi-billion dollar bridge/tunnel project in Virginia, light rail in Oregon, an Everglades reservoir in Florida –and what’s on the boards. There are other interesting news links to articles which would be of interest to the industry. 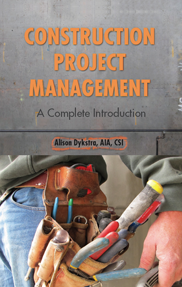 Over the coming months, we will be adding reviews of books which are useful to construction professionals. This is a book that’s been around a while (1985) but it definitely qualifies for multiple readings. The book flows like a novel as it traces the complex and often messy story of dreaming about, designing and building a house in Massachusetts. This isn’t a how-to book, however. Kidder is a journalist and his real interest is in exposing the complex relationships between owner, contractor, and architect and the book spares no detail in describing the sometimes painful birth of a project. Very helpful for understanding the various perspectives of the parties and the entire process. This classic has been around even longer (1961). Death and Life of Great American Cities helped do for urban planning what Rachel Carson’s book Silent Spring (published about the same time) did for the environmental movement. Jacobs was a journalist living in New York’s West Village who was a keen observer of what it is that makes cities vital and vibrant. Her analyses of the importance of neighborhoods – especially dense, mixed use, complex neighborhoods – helped spawn an entirely new appreciation for what cities are and can be. This book is a must read for anyone interested in the built environment. An interesting contemporary companion book, Wrestling With Moses, by Anthony Flint, is a modern David and Goliath story that recounts Jacobs’ successful fights against the policies of the powerful urban planner Robert Moses, especially his efforts to put a four lane road through Washington Square Park. Although not as influential as Death and Life, it’s a good book and a reminder of what determination and grit can accomplish. Very interesting perspective on politics and cities.